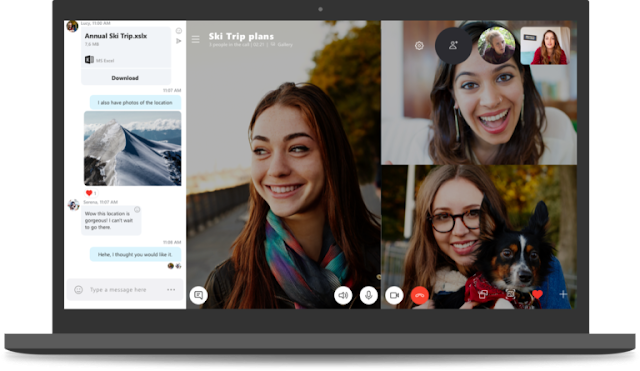 Microsoft has released Skype 8.0 for desktop, with the renown video-and-voice messaging platform bringing some new features, like free HD video and group calls for up to 24 people. While the new Skype also include new message reactions; with @mentions for individual notifications in a group chat, chat media gallery and photo/video file sharing capabilities. Asides the new Skype features, Microsoft announced the shutting down of support for the "classic" version (also known as Skype version 7.0) on Sept. 1, as it recommends that users should upgrade to the latest version of Skype for desktop. The company promises to continue to roll out improvements over the summer, which will include Skype version 8.0 for iPad, with encrypted audio calls and text messages and call recording, among other features. According to Microsoft, the underlying performance improvements and usability enhancements in the new version is designed to keep users connected to the people who matter most to them. As Skype version 8.0 is built based on feedback from its community — and adding exciting new features while ensuring it’s simple to use with the same familiar interface of Skype version 7.0. The latest version of Skype can also be upgraded from the app, simply select Help from the top toolbar and then select Check for Updates or visit Download Skype. If you need more information on which devices and operating systems Skype currently supports, you can check the support website here. Microsoft also requests your feedback which can be given through the “Send Feedback” option within the Skype app — just go to Settings and select Help & Feedback to send a message.